Simple, sturdy, Dutch. 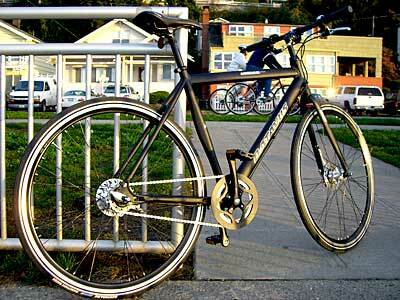 The Batavus Lightning is a urban, city bike. It’s equipped with Nexus 7 and roller brakes, which means clean lines and just a few cables. It’s modern looking and focused on form and function. With the big Schwable tires, powder-coated 7005 aluminum frame, and heft, the Lightning rides very solid, with sure steering, and comfort. The flat bar and adjustable stem are for an upright position. I was able to climb hills with the gearing and straight up, really dug this bike. There was plenty of tire clearance for fenders. With the dropouts, sliders and 130 spacing, I think you could run a fixed or single-speed as well. It’s a very understated bike and where an old-school bike industry dude would comment that it’s just another aluminum, flat-bar city bike, with 700c, and big tires; another would note that it’s got Dutch style and Nexus! One thing I did wonder is why there’s no bottle cage mounts? Well that’s because the Dutch are minimalists. The Batavus Lighting rides well on paths and in the city. MSRP is $999.99 and it’s shipping now to your local Independent Bike Dealer. Roller brakes are nice, but don’t brake like DA. Batavus’ website is not easy to navigate. I was unable to find this bike there, but your local dealer should get more details from SBS. The name of the bike was corrected to Lightning.